Carlton's Irish recruit Setanta O'hAilpin continues his development with Carlton's VFL feeder club the Northern Bullants. In our last update he'd had an impressive pre-season and opening match. That form has continued. The Philippines will host the 2005 Asian Championships on September 10 in Manila. This will be the sixth annual Asian Championships and the first to feature the Philippine Eagles. The report courtesy of Derek 'Dezza' Ackary. AFL Papua New Guinea's recent success at Under 16 level in the Australia Post Queensland Country Championships follows on from a good showing for their Under 18s in selection trial matches in February. Victorian Country Football Club of the Year, Maffra, will play a practice match against the New Zealand Falcons in preparation for the Falcons' tilt at the 2005 International Cup. Early reports are that the United States East-West All-Star event went well, with the East winning the All-American match and the West winning the All-Stars. Critically, tournament hosts Dallas were in talks with the All-Sport Television Network's filming crew immediately before the weekend, indicating the broadcast of matches is on track. 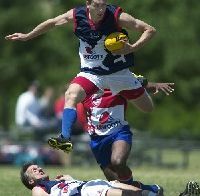 The USAFL's three year deal with ASTN is the source of huge excitement and potential for the game, but several aspects have concerned respected people in the game. So all concerned watch with baited breath, hoping everything continues well and local US footy begins appearing on screens across the US. The World Footy Census 2004 has, hopefully, answered the common question, of just how many players there are playing Aussie Rules in various countries around the world. It can also stand as an historic record of where the game has progressed to, and can be used as a measuring stick in the years and decades to come. It took 5 months to gather all the results from across 34 Australian Rules playing nations. Here we present all the results summarised and the countries ranked by total player numbers. Footy in the USA is taking a much more structured look these days with the consolidation of teams into regional leagues. None more so than the Mid American Australian Football League (MAAFL) with its seven teams fighting it out for the coveted Premiership Trophy. The emergence of the Eastern Australian Football League (EAFL) in 2005 is testament to the success of the MAAFL over the previous years and the general acceptance that there is a solid place for stand alone inter city games of Aussie Rules thoughout the US (i.e. a home and away season, not just tournaments and metro). Here is review of what the clubs have been up to in the off-season and what lies ahead. International Rules came to Denmark for the first time on the 16th April 2005 with a match between the North Copenhagen Barracudas and the Copenhagen GAA club. Copenhagen GAA are a club of the increasingly organised European GAA. Back in 1980 Kathryn Hogg was watching ESPN like many others sports mad Americans and was being fed a diet of wrestling and Aussie Rules Footy (VFL) by the newcomer to US cable TV. Jump forward to 2003 and she again discovered football, now branded AFL on digital cable after not seeing it for some years. Given the positive moves made in sports by women in the past two decades she decided to see if women were playing Aussie Rules. Hogg has now taken on an official role with the USAFL and we talked with her about future plans. In yet another coup for Papua New Guinean football, Australian football legend Malcolm Blight has agreed to coach PNG's national side, the Mosquitoes, if they make it to the grand final of the International Cup, in Melbourne this August. The following was compiled with the assistance of Henry Morabang (from PNG's The National). The Japan AFL have announced they are sending a team to compete in the Arafura Games from May 13th. This should be an ideal preparation for the Australian Football International Cup in August. Darwin has long been home to international footy competition and remains an ideal location for Australia's northern neighbours to compete. The Farum Cats have traditionally had the strongest juniors program in Denmark, and 2005 is shaping as another year of strong growth for the club. The Danish football league has restructured its format with the establishment of a super league comprising of five regional teams, each team having its own regional leagues as feeders. Farum Cats FC is one of two original clubs who have entered a super league team in their own right. This report courtesy of Jim Campion.